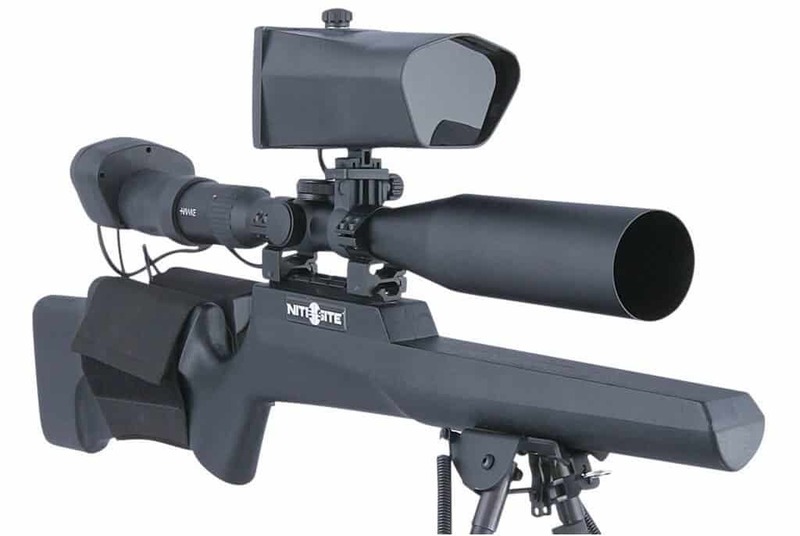 NiteSite is best known for their infrared technology that is mostly used for predator hunting. The RTEK night vision systems take it a step farther by allowing to tape your hunts with the push of a button. Even at night! The night vision and video recording systems come in three variants. 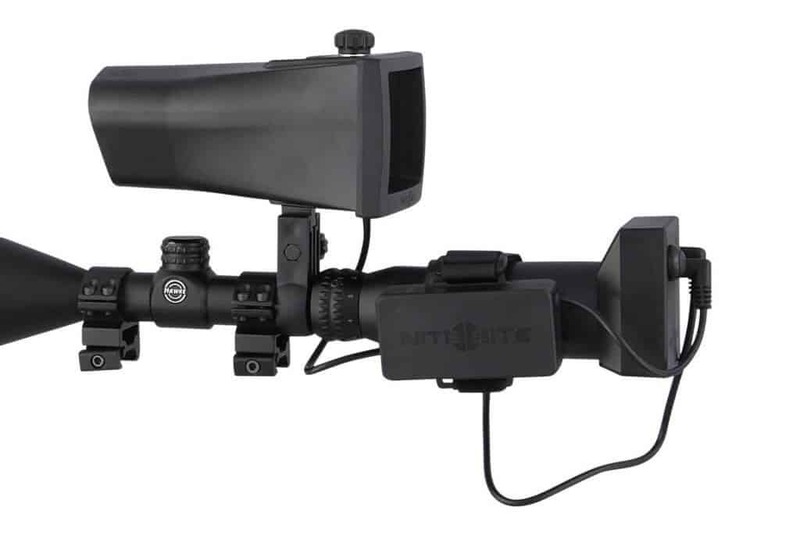 The NiteSite systems are designed to be used in daylight and during darkness on any rifle and with any scope. Assembly is simple and straightforward. The (night-vision) camera module sits in the back of your optical scope. It slides over the eyepiece of your existing scope to capture the view from your optics. ​Click here now to get the lowest price for the NiteSite Eagle RTEK on Amazon! The view from the camera through your scope is then transferred to a LCD screen. The NiteSite system includes a 1 inch and 30 mm setup to secure the illumination module with the LCD screen on top of your existing scope. You simply secure a clamp around the tube of your scope. The system is setup to both secure the LCD as well as reduce any recoil force. After both pieces are attached to your scope you connect both of them and you’re ready to go. The next step is to focus the setup as per instructions. The LCD displays visualizes what the camera records through your scope. The recording is stored on a Micro DS card. The system initially comes with a 4GB card which is enough for two hours and 20 minutes of recording. The system is battery powered. The included lithium-ion battery is mounted onto the scope. It is fitted onto the scope sleeve during use. The 2 Ah battery that comes with the Viper RTEK can last for up to four hours on half IR. The Wolf RTEK comes with a 4 Ah battery that lasts up to 5.7 hours at half IR. This 4 Ah battery is also mounted to the scope with a secure Velcro strap. The Eagle RTEK comes with a 6 Ah battery pack which is strapped onto the rifle stock. This can help to balance your rifle better. This battery is housed in a weather resistant pouch that is strapped around the stock. It provides battery power for up to 4.7 hours at half IR. Additionally, instead of just recording you can also stream the video directly onto your iPhone or Android device through Wi-Fi. The NiteSite system is Wi-Fi enabled and the app on your iOS or Android device can stream the video directly onto your handheld device. All NiteSite systems come with a 24 month limited warranty. They are all water resistant. The weight of the system is dependent on the model and starts at around 2 pounds. ​Click here now to get the lowest price for the NiteSite ​Wolf RTEK on Amazon! The MSRP pricing by NiteSite shows that the recording capability costs $250 for each model (price difference between the standard model and the RTEK version). If you want a convenient and reliable way to record your hunts during nighttime then this seems like a reasonable amount. There’s nothing more satisfying than being able to get a good visual in the darkness and then being able to record it and show the video to your buddies!